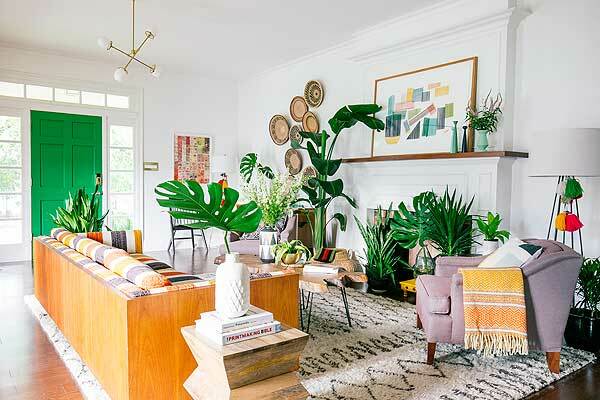 Designer and author Justina Blakeney coined the term jungalow by combining “jungle” with “bungalow” – in this case, a 1926 home in L.A. Blakeney used the term as the title of her blog, The Jungalow (www.thejungalow.com), where she shared her personal style with the world. In her new book, Blakeney explains how the design of her master bathroom was inspired by a vacation at Lake Tahoe. “The lake was so blue and so invigorating, so I wanted to lend that sprit to my bathroom,” she says. She chose a deep blue tile design to capture that feeling. “Caring for plants and caring for them is something that’s good for the soul,” she says. “And it’s something that’s been proven time and time again. We’re meant to be with nature. Bringing nature in to the home is a beautiful way to live."